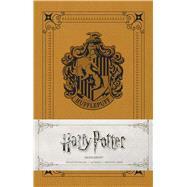 Show your Hufflepuff house pride by recording your magical adventures in this Harry Potter: Hufflepuff Ruled Notebook. This new addition to Insight Editions’ best-selling Harry Potter stationery line adapts the design of our deluxe hardcover ruled journal in a new softcover format. Featuring a flexible leatherette cover and 128 lined, acid-free pages of high-quality, heavy stock paper, the Harry Potter: Hufflepuff Ruled Notebook takes both pen and pencil nicely to encourage inspiration, inviting fans to record their thoughts and chronicle their adventures.